Glengarry Glenrothes. Too obvious? Do I care? Let me tell you something. This baby was bottled in twenty-ten. Two-oh, one-oh. So do the math. That’s 15 years of waiting for this moment. Waiting for YOU. Waiting for THIS MOMENT. And you’re sitting there like you’re holding a teacup? Like your book club is about to start? C’mon, you gotta remember how it goes. It goes like this. A-B-D. A-Always, B-Be, D-Drinking. Always be drinking, always be drinking. I don’t care that you have a family, that little Timmy has a little game today, that you promised your wife you’d clean out the garage. Forget that! No, it’s you and this bottle and this moment. So lean in and do it! Okay, so it’s in your glass. You and this glass and this moment. And you’re getting extra virgin olive oil with a sachet of cardamom and flash dried daffodil petals. It’s heavy on the nose like—I swear to god—my fist if you don’t get this done. And now it’s this whisky and your mouth. And it’s root vegetables and fingerling potatoes left to cool in a Mauviel copper pan. A meaty mouth of Tournedos Rossini substituting the filet mignon for something gamey. What’s that? You say lamb? Lamb? What, are we still at book club with your Sleepytime Pamperpants Tea? No this is closer to a mountain lion you took down with only the help of a Rolodex and a stapler. You got strips of mountain lion jerky cooking on the engine block of a Cadillac El Dorado in Death Valley National Park. It’s August. It’s hot. And you put a cinder block on the accelerator so the heat just explodes out into the desert in shimmering waves that could almost ignite the air. Yeah, there’s peppermint bark there, too, and anise seeds gently crackling open in slowly-browning pan of ghee. So what? Do you think this whisky cares what you think? That it worries about you? The signature of Glenrothes runs through this with the tenacity of your fear of failure. It’s like prune caramels wrapped in little wax papers, each with a failed lead pressed onto it with the edge of a thumbnail. The Glenrothes Vintage 1995 is a Cadillac El Dorado–Pre-modern dreams of a city of gold, awakened into the machine age, and set on a postmodern journey along a signless highway. Second place is a set of steak knives. Third place is you’re fired. 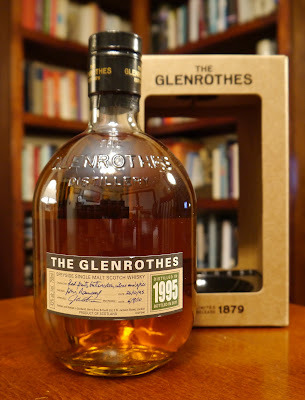 Our thanks to Danielle Katz and Glenrothes for the sample–and for the wonderful roll-out event for this one!